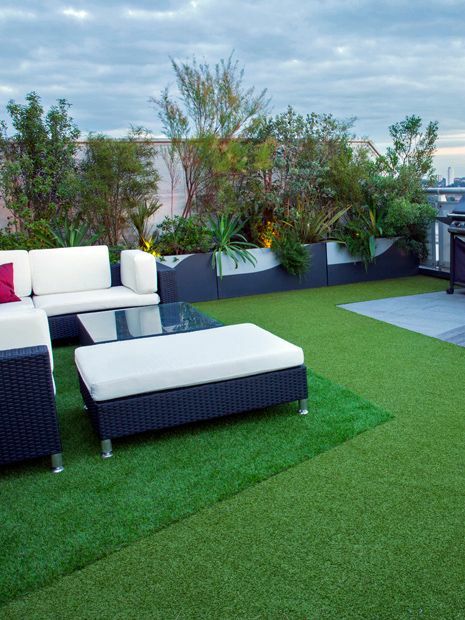 While designing an urban roof garden, we were presented with an artificial grass sample; we sought a vivid, fresh ambience, and the fibrous material was optimal. 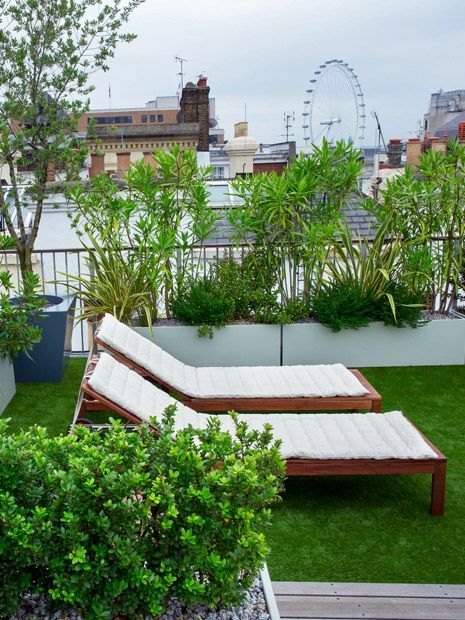 Short, tidy and easy to install, the turf was juxtaposed with Cedar and sandstone to create transition within a greenless rooftop setting. Since then, the synthetic grass industry had erupted, producing a multitude of choices, techniques and by-products. 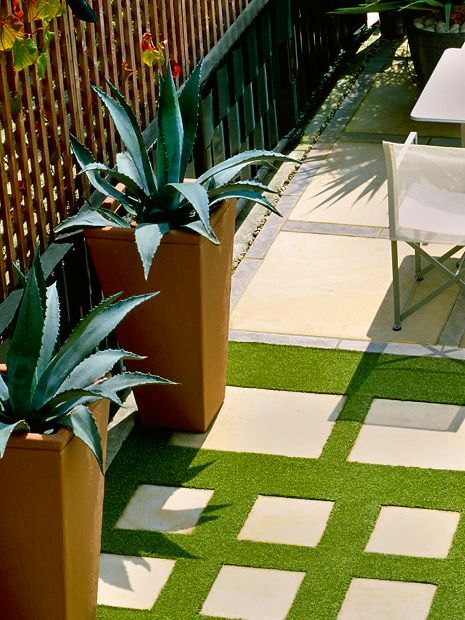 We utilise faux grass primarily in roof garden projects as a lightweight, non-directional, low upkeep surface – it's fun to include in gardens too; for play, sports, pet areas and family leisure. Towards the end of this Highgate project, where we designed a new small roof garden, the side of the house was being revamped. 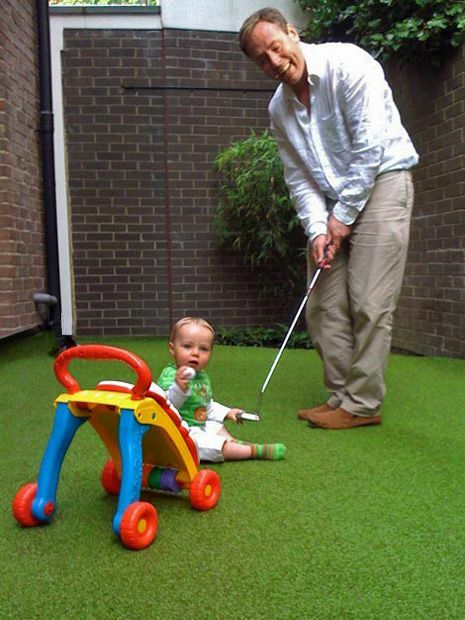 With a young boy running around and both parents golf fans, we created a putt & play area. Fairly thin at 12mm, the surface is scattered with kiln-dried sand and in most artificial grass installations, we further specify a 25mm-thick interlocking underlay pad made from recycled rubber which provides soft, yet firm cushioning, while minimising noticeable seam lines when the grass is laid over existing paving. 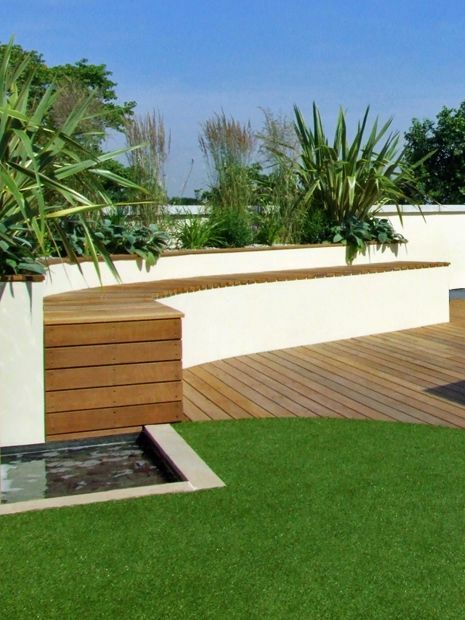 With a cricket ground forming the view from this curved Battersea roof garden, artificial grass was optimal for a spacious picnic area. The sinuous line between the deck and grass accentuates round tree canopies in the park backdrop, glistening in bright sunlight. This verdant lounge doubles as a 4-hole golf practice pad, with outdoor speakers, a sizeable daybed and a soothing waterfall design. 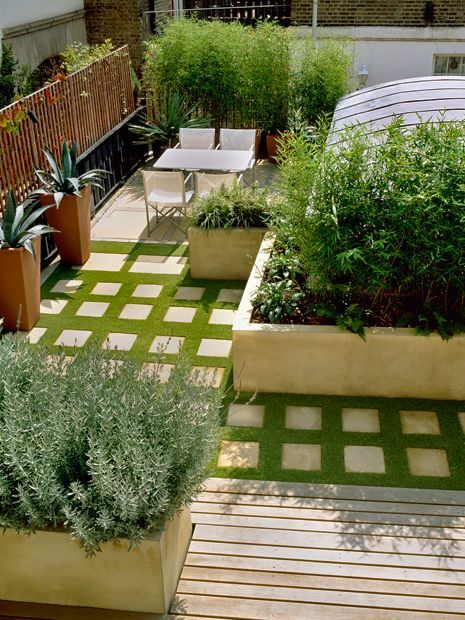 The 40 small squares in this Clerkenwell roof garden's surface motif were replaced with smooth paving stones by reversing two sections of grass and inverting the layout. Adapting the material to embrace its urban environment dynamically has created vibrant staccato rhythm, and infused grassy qualities within sympathetic hard landscaping. 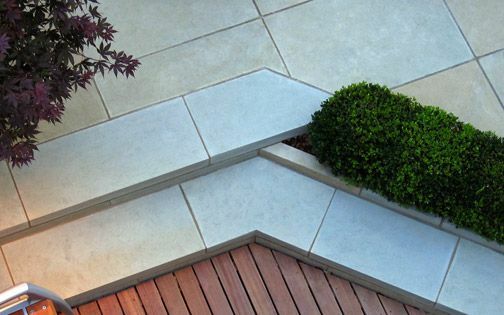 In this inner-city roof garden, the surrounding treeless landscape was invigorated by a green canvas, which envelops an L-shaped outline. 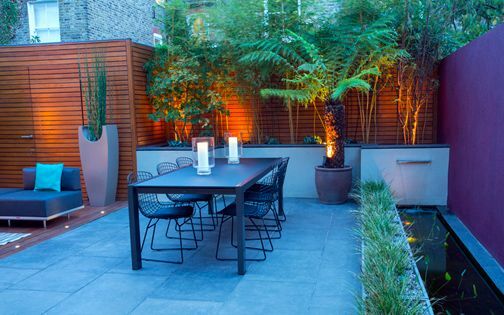 This lush, leafy corner forms a verdant tapestry within a large Covent Garden rooftop, where its layout is pivotal in humanising the space amid a Central London urban setting, while contrasting the outdoor kitchen and dining areas. With an architectural roof terrace design abundant in green hedges, Olive trees and herby foliage, the faux grass fuses an organic progression in its emerald feathery texture. For this Highbury family garden, we designed a tactile, fun zone to extend a play area for two boys, where variation in grass height and tone infused a touch of outdoor playfulness. In garden settings, it's best to include a compacted, granular sub-base to produce a solid, well-drained surface, where edges fastened to a wooden framework retain stability. Kiln-dried sand, brushed evenly into the grass fibres, provides a clean finish – a practice we often utilise in roof terrace landscape designs, large family gardens and golf putting greens. 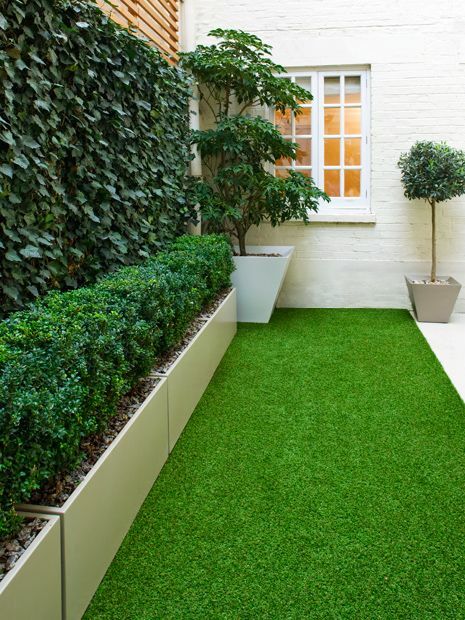 In this Mayfair courtyard garden, a low maintenance design extends functionality for the whole family, where we crafted an asymmetrical composition by utilising an artificial grass verge highlighting a white, tiled patio. 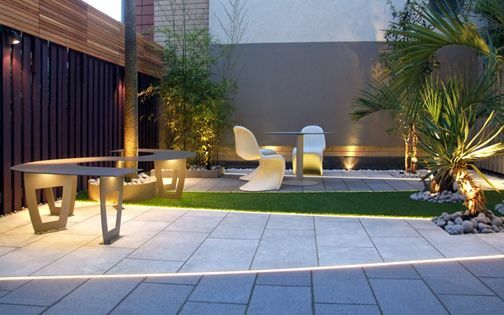 The minimalist layout enhances movement, producing a play area for two boys, while an elegant stretch of grass underlines Box hedging linearity, augmenting a layered detail design palette of tactile jade hues to complete a sequence of integral patio ideas. 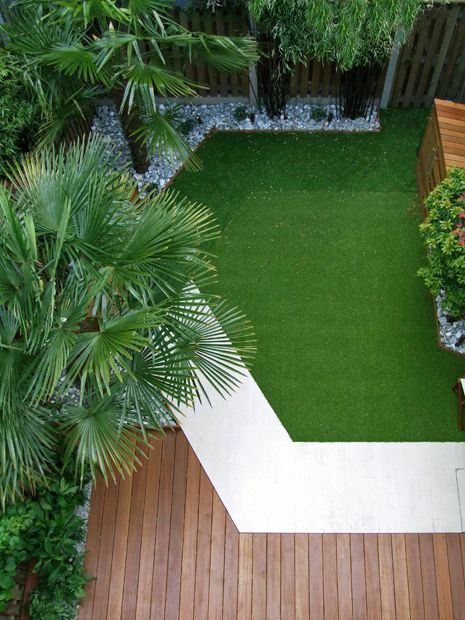 Artificial turf forms a versatile outdoor carpet, when shaped into varied contours. 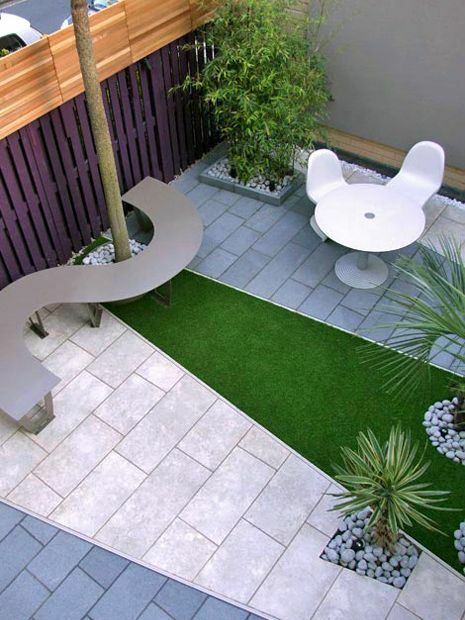 In this contemporary family garden, faux grassiness is centred between bands of granite and limestone, producing a lush, clean surface. The soft, green canvas is mirrored in surrounding Black bamboo and Palm tree foliage, defining an ideal scheme for both the grown-ups and their kids. 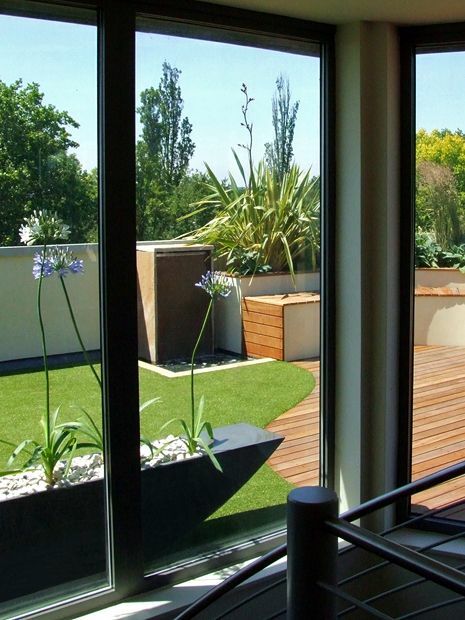 For a working family in North London, the grass provides upbeat ambience and less maintenance rigmarole. 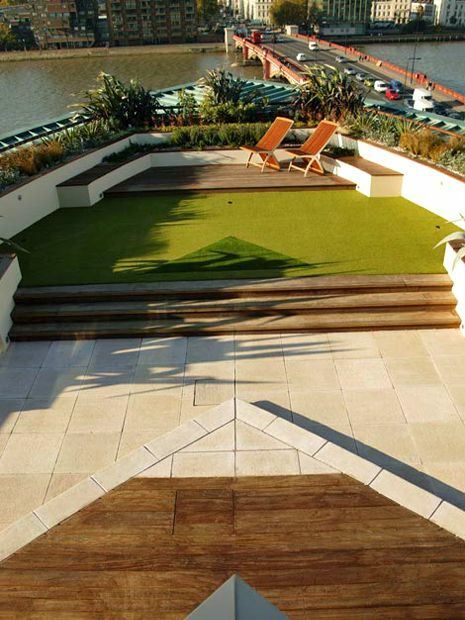 This expansive Vauxhall roof garden, at St George Wharf, required a surface solution for its upper deck, and when our client mentioned he often plays golf, we designed and installed a putting green. Along a gusty river aspect, with a diminishing greenscape, surrounded by a concrete forest of high-rise buildings, infusing a touch of verdancy is pivotal. The textured grass echoes globular London plane treetops along Albert Embankment in summer, floating tranquilly above River Thames in a surreal manner, while a deeper artificial grass motif replicates the roof garden's apex and its distinct boatlike outline – producing an easily manageable, sustainable rooftop environment. 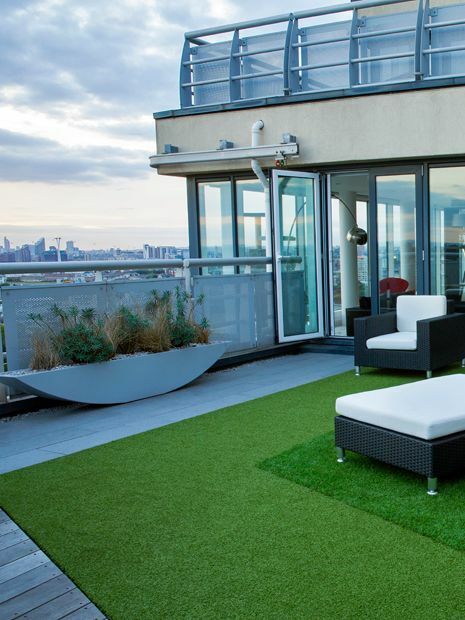 In this penthouse roof terrace, we sought to replicate the varying heights and colours of turfed lawns in nearby Thames Barrier Park. 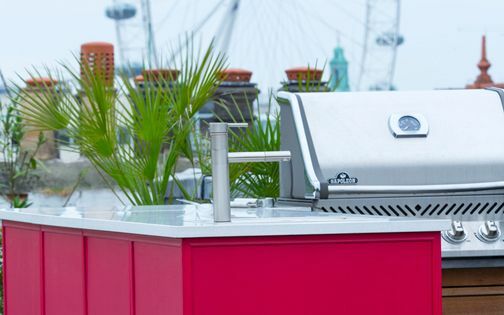 The highly flexible material enabled two grass heights and colours, and refined both the roof terrace design and installation aspects; its natural texture defined combinations of long and trimmed, light and dark, or coarse and soft turf, forming a high-rise grassy adventure. Synthetic grasses are manufactured in 2 and 4-metre rolls, and when developing large-scale areas, there are seams to be considered. While utilising the longer roll in roof terrace projects, we're facing a logistic conundrum, as the heavy material is tricky to carry. At times, we hire a furniture lift to transfer the grass up to the terraces – a technique which usually entails a larger crew, for an efficient and safe passage. 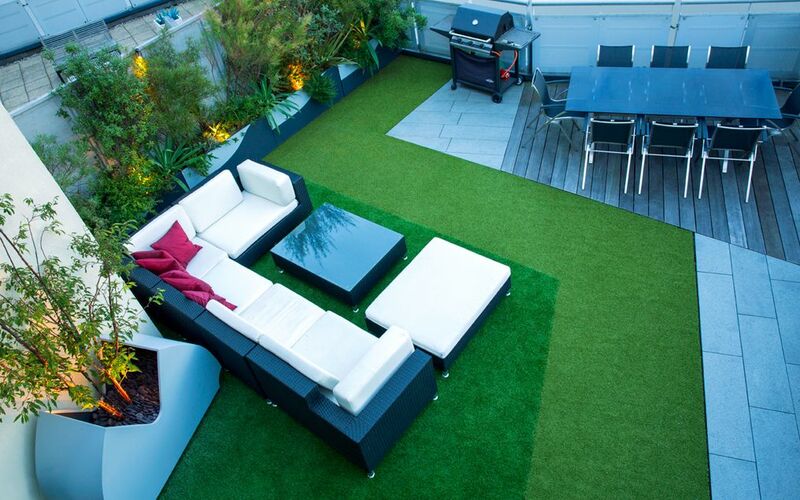 We include artificial grass as a diverse surface which forms a viable solution to many challenges. 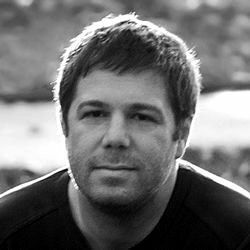 A sympathetic approach, focused detail and suitable context maximise its grassy illusion within a spectrum of outdoor spaces. 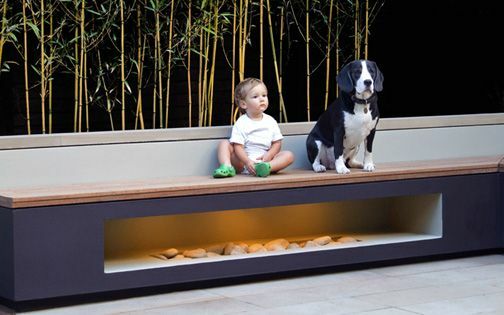 When there's less time for gardening, synthetic grass is truly handy – no mowing, watering, edging or constantly picking up worm casts; pet keepers would also appreciate its practical benefits – dog owners particularly. Some of us endure grass allergies, and could do with the synthetic stuff, yet, there's one quality absent in ersatz turf though – the definitive scent of freshly cut grass!